K118, was a 75-year-old lady. She suffered from chronic asthma besides high blood pressure. On 28 January 2003, A CT scan indicated a well-defined enhancing lesion in the anterior mediastinum to the left of the ascending aorta. It measures 2.5 cm in diameter. 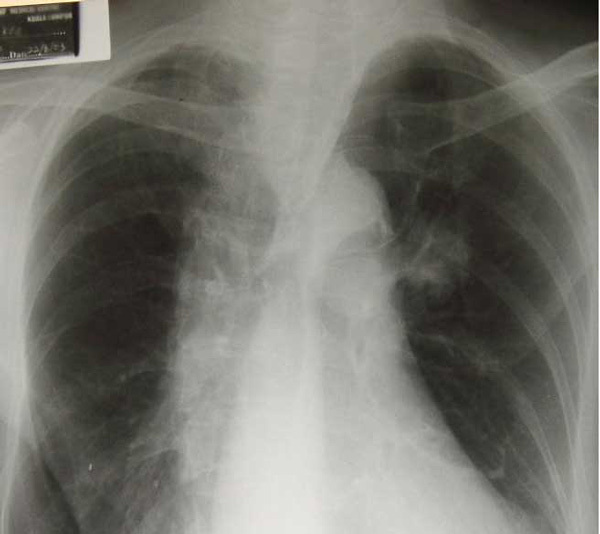 Moderate right-sided pleural effusion with passive collapse of the left lower lobe. A tru-cut biopsy indicated adenocarcinoma of the lung. At her age, chemotherapy or radiotherapy was not indicated. Her son came to us for help. She was immediately started on the herbs. We received two e-mails from her son who would like to share his joy with all of us. Just want to express my joy for the encouraging progress of my Mom’s case. My mom was diagnosed for lung cancer on 14 Feb 03. She is 74 years old. Her left lung was flooded with fluid and her legs swelled. Doctor advised that she would not be fit for any form of chemotherapy or radiotherapy. It was by chance that we were introduced to CA Care. My mom started taking the Capsule A, C-tea, Lung Tea (and later Lung 2 was added) and Lung-Phlegm from 17 Feb 03 onwards. On 22 Feb 03, our doctor examined her and found her left lung was clear of fluid and the swelling on her legs was gone. We continued to take the CA care herbs. On 22 Mar 03 an X-ray was taken and doctor was surprised that the lump in the left lung had shrunk to about one-third of the original size. My mom’s conditions are very well. Her appetite is good and she resumes most of her normal activities. I’m just too delighted on this and hope to share this information with everyone. The next consultation will be on the 24 May 03. I will update status of her conditions by then. I would like to update my mom’s case. It had been three months since she’s been taking your herbs. As mentioned in my e-mail dated 25 Mar 03, she recovered very positively after taking your herbs. Another good news is that she gained four pounds this time. We decided not to take any X-ray for the whole 2003 to minimise her exposure to radiation since she had gone through many X-rays and CT three months ago. I spent a few hours with my mom yesterday and found that she can do her normal household chores and talk as loud as before. I truly believe your herbs have brought her back from the dark. Well, on top of herbs, I found also that cancer patients really need a lot of emotional console and morale support everyday. We all must be strong at heart to carry out this battle of cancer. Thank you to your contribution to mankind in this difficult battle against this disease. The patient died in December 2004 – about two years after being diagnosed with lung cancer. She was able to lead a normal life, free from pains and debilitating problems. Was her death due to cancer or old age?